A brief description of how GnuTLS sessions operate is shown at Figure 6.1. This section will become more clear when it is completely read. As shown in the figure, there is a read-only global state that is initialized once by the global initialization function. This global structure, among others, contains the memory allocation functions used, structures needed for the ASN.1 parser and depending on the system’s CPU, pointers to hardware accelerated encryption functions. This structure is never modified by any GnuTLS function, except for the deinitialization function which frees all allocated memory and must be called after the program has permanently finished using GnuTLS. Figure 6.1: High level design of GnuTLS. The credentials structures are used by the authentication methods, such as certificate authentication. They store certificates, privates keys, and other information that is needed to prove the identity to the peer, and/or verify the identity of the peer. The information stored in the credentials structures is initialized once and then can be shared by many TLS sessions. A GnuTLS session contains all the required state and information to handle one secure connection. The session communicates with the peers using the provided functions of the transport layer. Every session has a unique session ID shared with the peer. 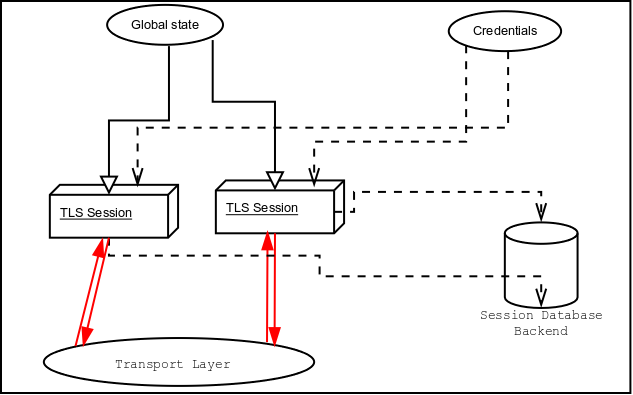 Since TLS sessions can be resumed, servers need a database back-end to hold the session’s parameters. Every GnuTLS session after a successful handshake calls the appropriate back-end function (see resume) to store the newly negotiated session. The session database is examined by the server just after having received the client hello16, and if the session ID sent by the client, matches a stored session, the stored session will be retrieved, and the new session will be a resumed one, and will share the same session ID with the previous one.